Madness does not come by breaking out, but by giving in; by settling down in some dirty, little, self-repeating circle of ideas; by being tamed. There is something about seeing animals in a zoo that saddens me. I know they are, for the most part, treated well. I know that many of the animals in our zoos today are there because there were found injured or orphaned. But walking on that paved path, seeing them lying lazily under fake stones with huge balls to play with while people gawk or laugh or take photos, is such a desperate sight. Then our big blue bus pulled through Yellowstone. For the five days we were there, all we wanted to see was a bear in the wild. Preferably a grizzly. Preferably with cubs. And preferably at a safe distance. There’s nothing like a mauling to ruin an otherwise good vacation. We saw huge, lumbering bison wandering through fertile fields. 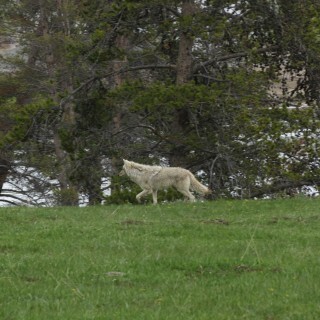 We saw lone coyotes scamper along the edge of the forest. We saw majestic elk running in herds. But we couldn’t find any bear. Then, on day three, I decided to drive out to check my email. We had no internet or cell phone access at the campground, and it was about thirty minutes to a high point where I could get online. Maile and the kids decided to stay behind, and I took off in the minivan. You see what’s coming right? Along a particularly beautiful stretch, cars lined the road – this usually means there’s something cool to see, so I slowed down and parked along the edge. 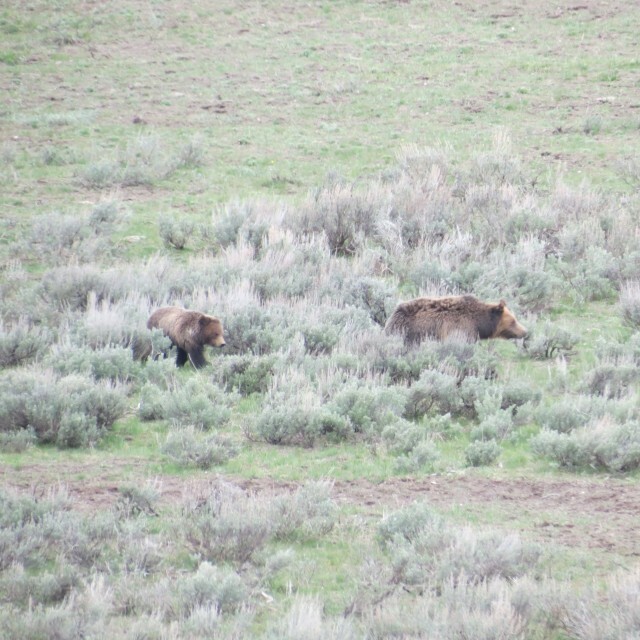 Then I saw them: a grizzly bear and two cubs galloped down a nearby hill, towards the road. 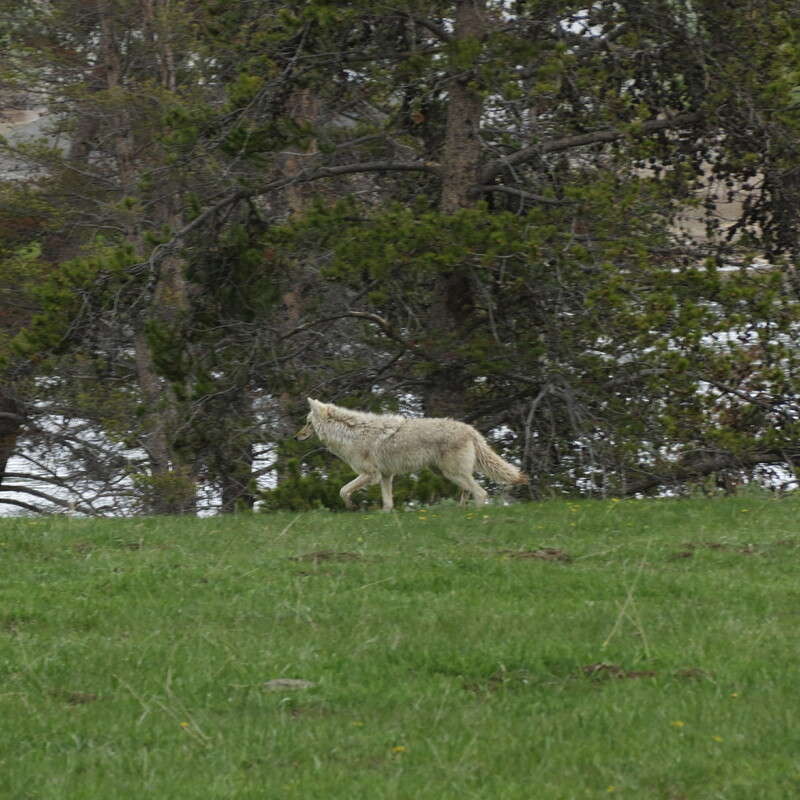 Everyone outside of their cars suddenly scrambled for cover as the bears sprinted across the road, between the single-file line of parked cars, through the adjoining meadow, and into the river. All three of them swam through the icy water, their heads bobbing along. They were wild and untamed and unpredictable. There was something hugely appealing to this thought, that they lived life on their own terms, without protection from mother nature or other animals. They foraged for their own food. They bred and bore cubs and hibernated, and the life they lived was their own. They were assured of little, but they were also imprisoned by no one. Do not settle down. Do not allow yourself to be led into some “dirty, little, self-repeating circle of ideas.” Do not allow yourself to be tamed by your parents or your peers or your pastor. They mean well. They want things for you, things they think are good, things like safety and comfort and predictability. Free yourself. Live the wild adventure that God has prepared for you. Run through the fields. Swim the icy river. Be who you were created to be – it’s the only way to stay sane in a world gone mad. This makes me think of what I tell my kids, especially my 17 year old daughter. “Be careful”. We want safety and security for our loved ones. We don’t want them to experience danger. Yet it is our brushes with danger that give us the experience of life. I’m not talking about rushing into foolhardy chances. But how about the danger of doing what you love versus the security of “things”? I have to walk a fine line with families that would like me to encourage their children down a more “tried, true, and traditional” path. I understand what they want for their kids. I also know that some children will not appreciate that path, if ever, unless they break out on their own for a while. Others live a life feeling trapped, sometimes leading to a double life that hurts everyone in the relationship. Did you get any pics of the bears?!? I really should have offered a disclaimer, that while my dad is also my pastor, neither he nor my mom have ever tried to “tame” me. They are more encouraging and supportive than I deserve. No disclaimer needed. You called out parents and peers, too. It is all good when you equally offend everybody. Enjoy your blessings, brother. Glad you had a good trip. Having just left a church with a heavy taming bent, I am more convinced than ever that parenting and pastoring look so different when we flip them to be about working for someone else’s delight rather than wielding our own dominion. Thank you for saying it with a story. This spoke to me, Shawn. I have often felt the same way at the zoo. I wonder what happened that the Christian sub-culture became so obsessed with safety? Where is that in the Bible? Living boldly & sacrificially & differently- these are the things that Jesus preached. I think it speaks to our misconceptions about God’s character. Which reminds me of the depiction of Aslan in C.S. Lewis’ Chronicles of Narnia. God is good, but that does not mean He is safe. Well done, Shawn. My kids have been the thing that prevents settling. When I think I long for a routine, set time and space for everything, I see them quite literally gambling through life. Metaphorically, I can’t keep up with their needs…there is always a concern or a growth stage or a thing to notice and be grateful for. Last week I read this post on the eve of a big job decision, paralyzed by anxieties and thoughts of leaving my closest family and friends behind. It was sobering. And I could hear God saying that he’d made me for bigger adventures than what I’ve been living. So I took the job. And in just a few weeks, I’m moving all my belongings to Nashville – 13 hours from the state I call home. Your words were part of the decision-making process – thank you!